Reenactment of the Battle of Crysler’s Farm. The dismantling of the St. Lawrence Campaign during the War of 1812 was a two-step process. 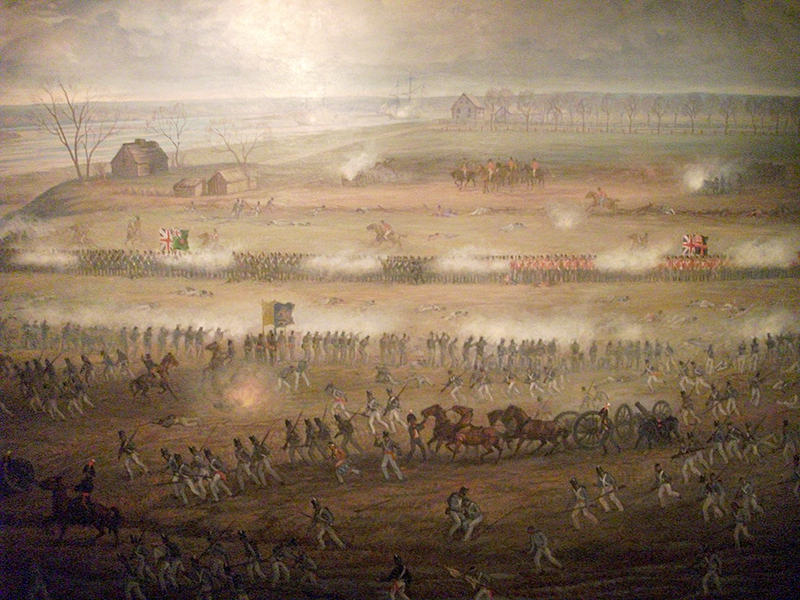 The first part was the Battle of Châteauguay in Lower Canada. The second part and the subject of today’s post was Crysler’s Farm. On November 11, 1813, John Crysler’s farming fields became the site of the decisive battle that marked the end of the attempt to capture Montreal. Lieutenant-Colonel Joseph Wanton Morrison led the British contingent to an underdog victory, (1,200 vs 4,000), making it similar to its predecessor. Yet when you type “the battle that saved Canada” into Google, Crysler’s Farm shows up. That is quite a big claim to make about a single battle. Does it deserve that title? What makes Crysler’s Farm stand out among all the other important battles that took place throughout Canadian history? 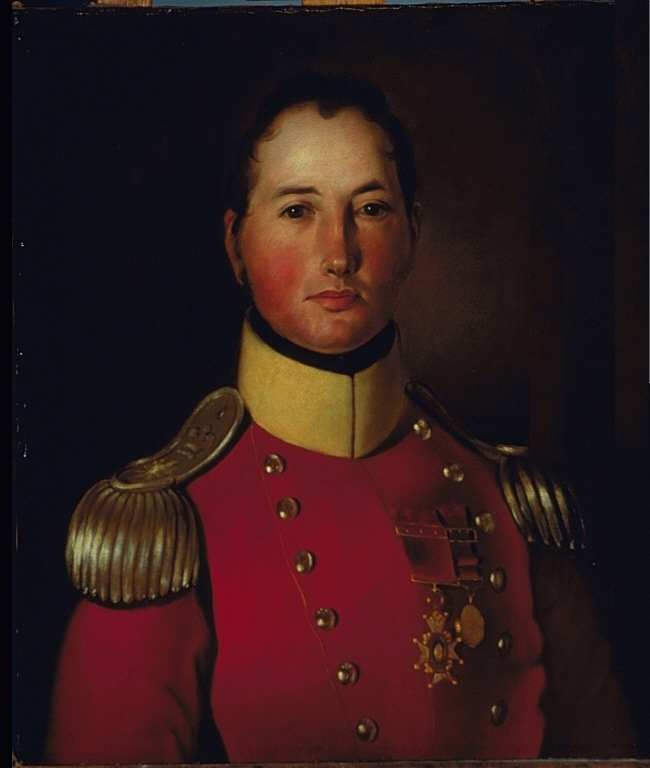 Portrait du Major Général Joseph Wanton Morrison (1783-1826), C.B., Col. 44e régiment. Artist unknown. Joseph Wanton Morrison was born on May 4, 1783 in New York, during the time the state was under British occupation during the American Revolution. He followed in his father’s footsteps and joined the British army. Morrison began his military career as an ensign in the 83rd Foot in 1793. He served in the Netherlands, Ireland, and Trinidad before he was sent to British North America due to the outbreak of the war. The majority of Morrison’s force came from the 49th and 89th Regiments of Foot. These were highly-trained, highly-experienced British soldiers who had already seen a fair bit of action during the war. Prior to Crysler’s Farm, they had been stationed in Kingston. By the time the battle happened Morrison’s command grew to include men from the Canadian Fencibles, Royal Artillery, Canadien Voltigeurs, as well as Mohawk and Mississauga warriors. Of the 270 Canadian regulars under Morrison’s command during the battle, two-thirds were from Lower Canada. James Wilkinson by John Wesley Jarvis (c. 1813). He is described as “a general who never won a battle or lost a court-martial” by historian Robert Leckie. To recap, the American strategy was known as the St. Lawrence Campaign. In a classic pincer’s movement, Major General Wade Hampton I and Major General James Wilkinson were supposed to advance towards Montreal via Lake Champlain in the east and Sackett’s Harbour in the west. Unfortunately for them, one arm of the pincer got cut off when Hampton was defeated at Châteauguay on October 26th. Before we get to that though, back on October 17th Wilkinson’s force had left Sackett’s Harbor, New York, via a small fleet of ships. Before their flotilla reached Montreal, they intended to seize the small town of Cornwall to replenish their supplies. The British were initially surprised when they realized the Americans were headed for Montreal and not the military stronghold of Kingston as they had expected. They switched from defense to offense and went after the flotilla. Knowing that the Americans greatly outnumbered them, Morrison’s soldiers spent time sniping at their supply boats and by the time the Americans neared Cornwall, they were down a couple of ships. On November 10th, Wilkinson set up camp at a local tavern between Morrisburg and Cornwall. They intended to push through the sniper fire and carry on to their destination which was only 35 km away. Morrison had other ideas though. He and his men set up their camp on a farm belonging to a fierce loyalist, John Crysler. The Americans were not originally planning for a full-on battle. However, when they saw a bunch of enemy soldiers essentially resting in an open wheat field, the desire to take them out and no longer be chased by the British proved to be too strong. Which is exactly what Morrison had wanted. Frequently described as a “classic, European-style battle,” (two armies engage each other in an open field), the two sides met on a Crysler’s fields on the morning of November 11th. Since Morrison had picked the battleground, he was able to choose better positions for his men. To even get to the battlefield, the American troops were forced to make their way through two large ravines. Then they had to cross the actual field itself, which was muddy due to early morning rain and it was littered with split-rail fences. The British light troops were the first to attack, but they were driven back. Encouraged, the Americans tried to advance, but their attempts were thwarted as they were overpowered by volleys from the skillful 49th and 89th Regiments of Foot. (A volley is a tactic in which a line of soldiers fire their weapons at the same time). Also, since the field was right next to the St. Lawrence, the British position was further aided by Captain William Mulcaster and his a small flotilla of gunboats firing as they sailed along the river. So the American infantry had to deal with that and the overpowering 49th and 89th Regiments. A reenactment of the Battle of Crysler’s Farm demonstrating the use of musket volley fire. The American soldiers found themselves in a state of disarray and confusion. Boyd’s leadership was contradictory and ineffectual. Their artillery and cavalry were missing in action. Their comrades were falling in higher numbers than their opponent. If they weren’t getting picked off by the British regulars, they were dealing with the Mohawk and Mississauga warriors. There was also the well-trained Canadian Voltigeurs and Fencibles to contend with. The whole battle itself had only lasted a couple of hours. In the end, the fact that the British only made up roughly 30% of those on the battlefield meant nothing. By the time the artillery and cavalry showed up, many of the American soldiers were already in retreat. The casualty rate was more substantial than at Châteauguay. For the British, 31 had been killed and 148 wounded. For the Americans, 102 had been killed and 237 wounded. Wilkinson was, of course, pissed and it didn’t help when he got Hampton’s “you’re on your own” letter the next day. With no backup on the way, Wilkinson abandoned his Cornwall-to-Montreal trek and the Americans retreated to New York for the winter. This decision effectively ended the St. Lawrence Campaign. Wilkinson later tried to claim that Crysler’s Farm had been an American victory and denied retreating. He must have been hitting the laudanum hard again because no one bought that. For some reason, their military decided not to remove him from command until after the Battle of Lacolle Mills (1814), where once again a small British contingent beat off a larger American force. Fun Fact: The War of 1812 was Wilkinson’s second (failed) military career, having been ineffectual during the American Revolution too. After his death, it was discovered that he had been a double agent for the Spanish and had plotted treason with the much-hated Aaron Burr. Needless to say, he’s not a popular figure in American history. A 1895 memorial for the fallen at the Battle of Crysler’s Farm by the Canadian government. Now back to the central question of this post, was Crysler’s Farm really the battle that saved Canada? What about the Battle of Quebec or the Battle of Queenston Heights? To answer this, one has to look at the larger context of the battles. With regards to Crysler’s Farm, the Americans wanted to capture Montreal because it would have given them control of the St. Lawrence River. This would have led to Britain’s defeat because it would have stifled Lower and Upper Canada of supplies and troop transportation, as well as killed communication lines. Symbolically, it would have split British North America in half. Of course, the lower half of Quebec, the Great Lakes, and a fair chunk of Ontario is not the entirety of Canada so it would be unfair to suggest that Canada and Confederation would have never happened. It just definitely would not have happened in the manner in which it did in 1867. After all, would Sir John A. MacDonald or George Brown’s families have emigrated from Scotland had British North America no longer existed? Also, George-Étienne Cartier and a number of the Fathers of Confederation would have become or been born American citizens. As such, the Canada and the US that we know today arguably would have had a much different look had the Americans captured Montreal in the War of 1812. With all this in mind, I’ll let you decide if Crysler’s Farm “saved” Canada. What do you think? Graves, Donald E., Field of Glory: The Battle of Crysler’s Farm, 1813, Montreal, Robin Brass Studio, Inc (1999). Good post. Kinda torn between which was more important, Chateauguay or CF. I guess this one since it was the final straw but if Montreal got taken over, who’s to say they wouldn’t have revolted and kick the Americans? You have a good point. Montrealers could have revolted and tried to overthrow the invaders a la 1775. The only obstacle I can think of is numbers this time around. The Continental US army had around 1200, whereas the British/Quebec City forces had 1800. If Wilkinson and his 8,000 men made it to Montreal a lot of their problems (fatigue/supplies/illness) would have been resolved. They would have been in a better position to fight battles than they were at Crysler’s Farm. Also, with control of the St. Lawrence, the US could have sent further reinforcements to crush any revolt so….yeah. Not saying it couldn’t of happened, but they would have had a hell of a time!